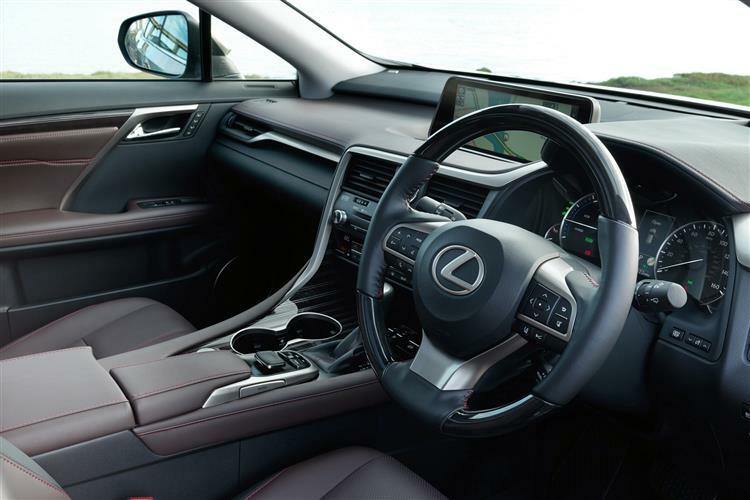 Large, plush SUV motoring is personified by the Lexus RX. Since an original launch back in 1998, it's been finding a select but loyal band of buyers, usually with hybrid power - though this car still doesn't offer the clever Plug-in technology now being used by other rivals in this segment. This revised version is better equipped and can, if you wish, also be ordered in 7-seat RX L guise. Let's check it out. 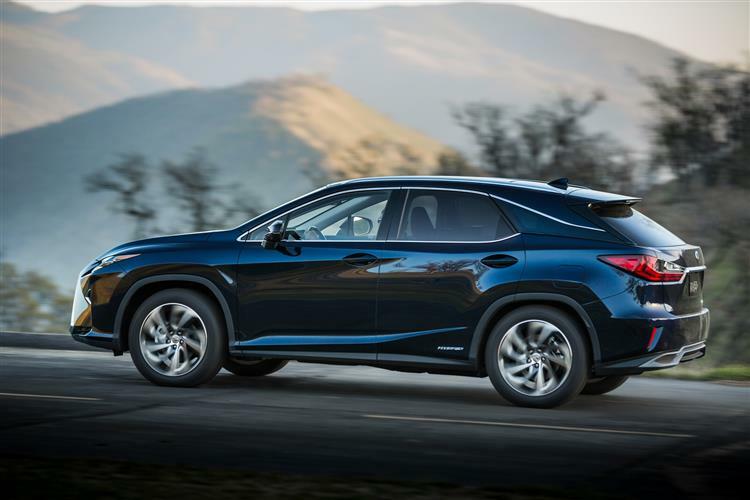 In an era where other brands trumpet hybrid engines in the luxury SUV segment as if they're the latest thing, Lexus can afford to feel rather smug. Toyota's luxury brand has been selling petrol electric power in its RX model in this market sector since 2005 and has further refined that technology in the fourth generation version we're going to look at here. Surprisingly, the brand has chosen - for the moment at least - not to follow rivals in offering buyers hybrid power with a Plug-in option, but it has that technology at its fingertips for the future. Of course, not every buyer in this part of the market wants a hybrid, but Lexus doesn't agree with the diesel technology that rivals offer. Engines apart, this better equipped MK4 model RX looks tempting, though it still won't be the first choice for those prioritising driving dynamics. So what's the RX 450h hybrid like? 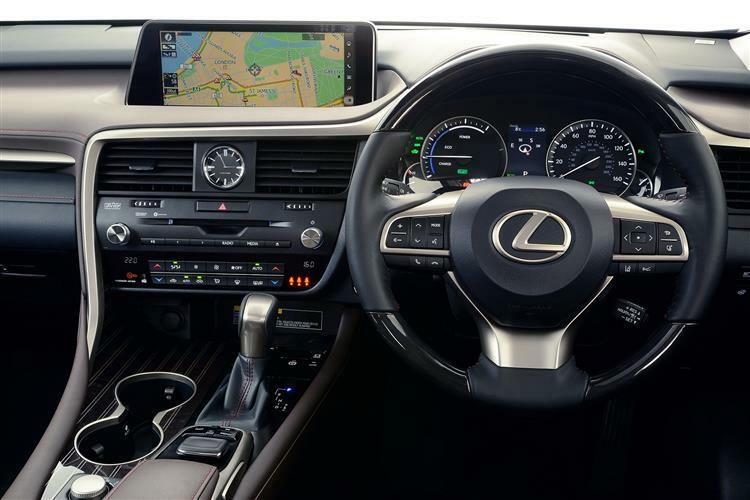 Well you get in, luxuriate in the beautiful leather seats and enjoy the commanding SUV-style driving position before pressing the starter button to be greeted by.. Nothing. The engine's running, true enough. It's just that at this point, it's doing so silently under battery power alone and if you've a gentle right foot, that's all it will continue to use at speeds of up to 30mph before the 3.5-litre V6 petrol engine kicks in, controlled via a six-speed CVT auto gearbox. This mechanical package is much as it was before, with power rated at 308bhp and there's a useful 335Nm of torque for towing. It sounds good too, thanks to a sound generator system that creates a performance-style air intake roar. The E-Four 4WD system's functions have been tuned for sharp response when accelerating through bends. Don't expect too much in terms of off piste ability though. Lexus doesn't think potential buyers will be interested - and they're probably right. Instead, the brand has concentrated on improving the tarmac response of it's the steering and suspension systems in recent years, so as to create a more involving drive. And sure enough, the RX is still one of the most comfortable, refined SUVs in its class. 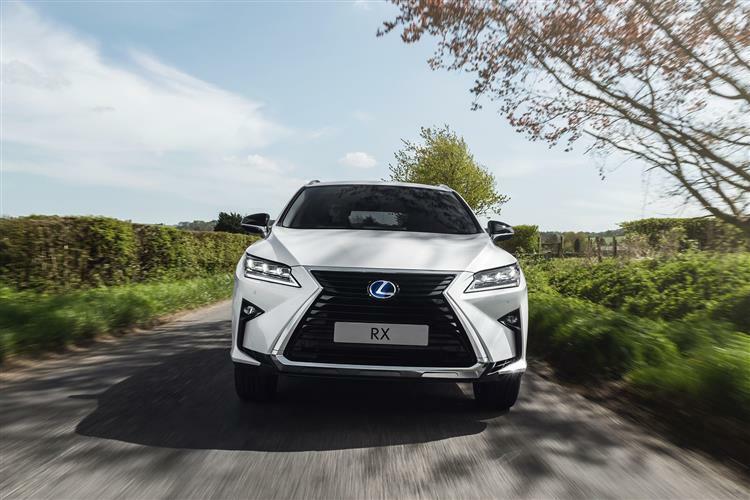 This fourth generation RX was designed from the outset as a significantly bigger SUV that its previous generation predecessors. And a more stylish one too, with eye-catching external creases and curves that capture the design language evident in the sheet metal treatment of other recent Lexus models, such as the IS, NX and RC. At the front end, the Lexus signature spindle grille is contained in a chrome-finished frame and flanked by LED headlights. 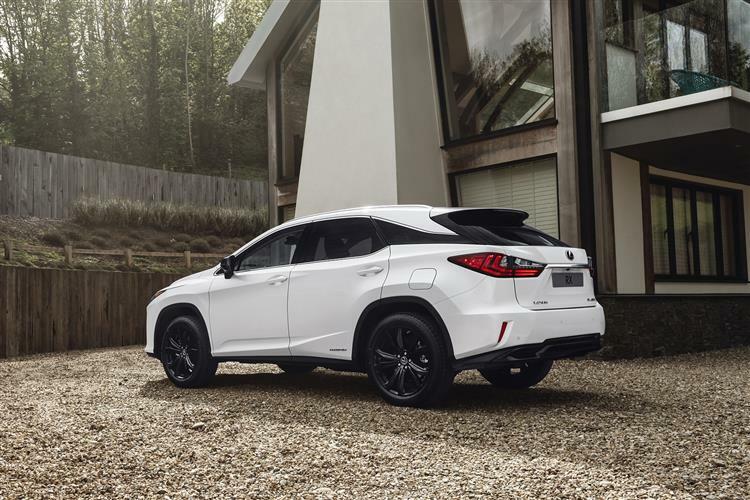 The sharply tapering front and rear wing flares add muscle to the RX's appearance, while the main body section displays a diamond shape that flows out from the front spindle grille and back to the tailgate. Inside, there's a classy, spacious cabin that sits its passengers relatively low for better headroom. 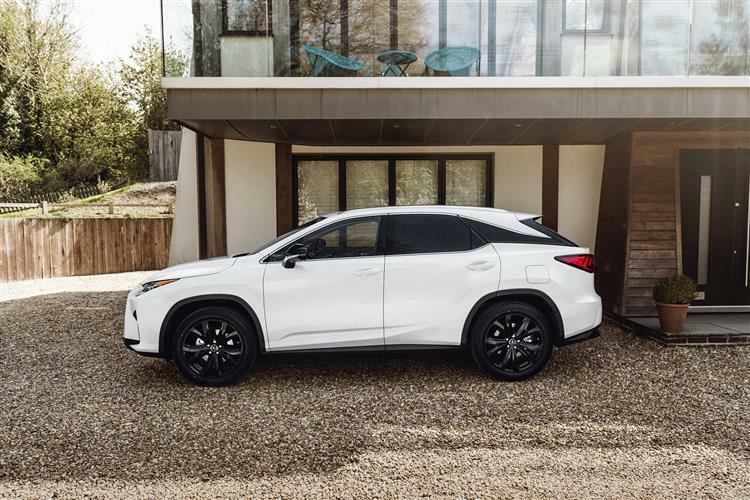 Lexus has paid special attention to the comfort of rear seat passengers, and by lowering the rear floor section has produced a seating position that bears comparison with the LS limousine. Cargo capacity remains slightly compromised in hybrid guise, though will be sufficient for most owners. There's also a slightly lengthened RX L seven-seat bodystyle if you want it. List prices start at around £50,000 for this car in base hybrid 450h 'RX'-spec form. Next up is the 'Sport' version, costing around £55,000, then the top 'Takumi' derivative, prived at around £62,000. That's for the standard body shape. If you want the lengthened RX L 7-seat version, there's a premium to pay which varies from around £1,200 if you go for base trim to as little as around £300 if you've chosen top 'Takumi' spec. Pricing represents decent value compared to notable rivals like BMW's X5, Mercedes' GLE and the Range Rover Sport. All RX models, as you'd expect, are very well equipped. Across the range, you'll find standard features like full-leather upholstery, powered heated seats, dual-zone climate control, rear privacy glass, the Lexus Navigation system with an eight-inch display screen, a nine-speaker audio set-up with DAB, a reversing camera, LED headlamps, roof rails and dual chrome-tipped exhausts. Across the complete range, Lexus Safety System+ is fitted as standard, providing active safety systems that help prevent or mitigate collisions in the most common traffic accident scenarios. Elements include a Pre-Collision System, Adaptive Cruise Control, Lane Keep Assist, Sway Warning System, Traffic Sign Recognition and Automatic High Beam/Adaptive High-beam System. 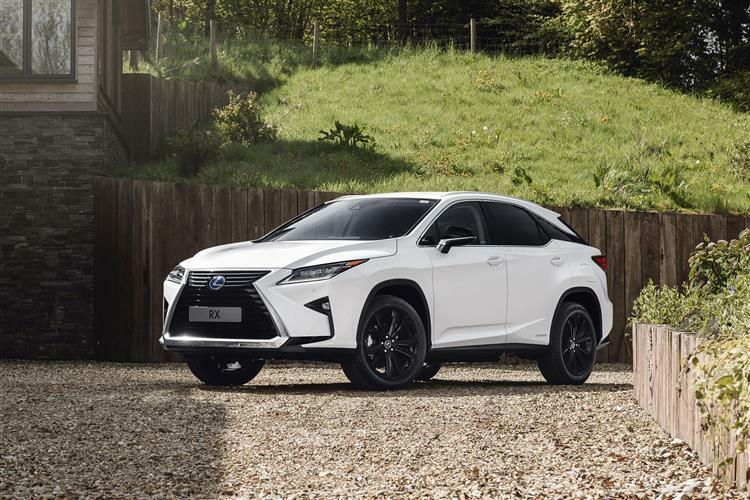 The WLTP returns on offer from this RX450h - 35.1mpg-37.3mpg and emissions returns from 132g/km of CO2 with 18-inch wheels fitted - look very good indeed. You're essentially looking at diesel-style running costs with cheaper green pump fuel, plus the kind of CO2 figure that'll really make a difference when it comes to the bottom line figure on your tax return. Of course, much of the time - when you're waiting at a traffic crossing for example with the engine seamlessly disabled and battery power in motion - you won't be emitting any CO2 at all. Electric-only use doesn't just eliminate CO2 dirtiness: it also gets rid of Nox exhaust emissions too, green-friendliness today's government wants to incentivise. 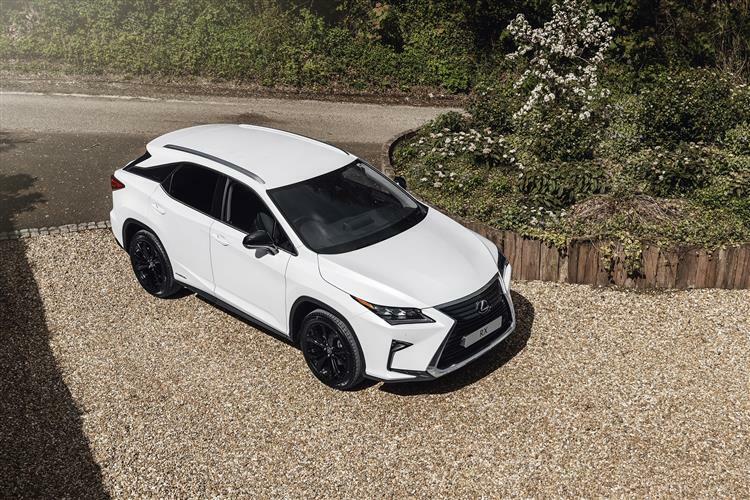 As a result, Lexus reckons that ownership of this car could save higher-rate tax payers a considerable amount when they compare this car against some of its less efficient diesel rivals. At the same time, the companies they work for will benefit from a handy 20% write-down allowance against tax.